#RM-KMB-8. Here is an exact reproduction of the 11 page KMB-8 maintenance and repair manual complete with exploded view drawings. This information will be similar to KMB-9 and 10 models. Price $18.50. #RM-NAV56. 1956 US Navy Navships Instruction manual for the Aqua-Lung Demand Type Diving Apparatus. 20 page xerox reproduction of the US Navy Bureau of Ships manual. Covers theory of operation and overhaul of the "Trademark" 2 stage Aqua-Lung , and military 90 CF aluminum tanks, valves, and associated parts. An excellent reference. Price $18.50. #RM-NAV67. 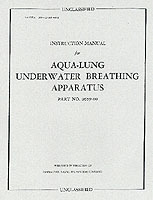 1967 Navsea Instruction manual for the Aqua-Lung Underwater Breathing Apparatus. 24 page xerox reproduction of the US Navy Navsea 0994-LP-007-4010 manual. Covers theory of operation and overhaul of the DA Aqua-Master, and military 90 CF aluminum tanks, valves, and associated parts. An excellent reference. Price $18.50. #RM-MNA. 1955 US Navy Instruction book for the Northill Air Lung two hose regulator. 24 page xerox reproduction of the US Navy Navships 394-0057 manual. Includes detailed description, principles of operation, operating and maintenance instructions, parts list, and more. An excellent reference. Price $18.50. #RC-V55. 1955 Voit fold-out brochure/catalog - Voit's first year! Full color xerox reproduction. The original was one piece and measured approximately 11 x 24 inches. The reproduction is made in two pieces, one at 8 1/2 x 11, and the other at 7 x 11. 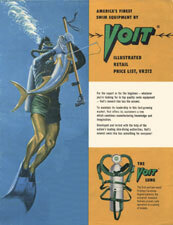 Includes the first scuba items sold by Voit, such as the VR1 and VR2 two hose regulators with green labels and green hoses, along with masks, fins, spearguns, and more. Price $18.00. #RC-USD56. 1956 US DIVERS Aqua-Lung Equipment Catalog. 32 page xerox reproduction with color cover, folded and stapled just like the original. Price $18.50. #RM-NA56. 1956 Northill Air-Lung Instruction Book and Parts List. 14 page xerox reproduction with color cover, folded and stapled just like the original. Price $12.00. #RM-HHR. HANS HASS ROLLEIMARIN CAMERA HOUSING INSTRUCTION MANUAL. 10 page xerox reproduction on heavy paper, with color cover, folded and stapled just like the original. #RM-USDC. US DIVERS CALYPSO UNDERWATER CAMERA OWNERS MANUAL. 13 page xerox reproduction with color cover, folded and stapled just like the original. Price $12.00. #RC-RP61. 1961 Rose Pro Equipment catalog. 8 page xerox reproduction with separate price list, folded and stapled just like the original. Price $10.00. #RC-N63. 1963 Norseman Equipment catalog. 8 page xerox reproduction, folded and copied on both sides just like the original. Price $10.00. #RM-HW62. 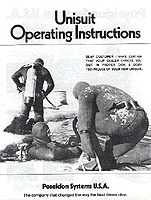 1962 Technical manual for Healthways Scuba Equipment. Includes basic instructions for use and maintenance of all Healthways scuba equipment. 43 page xerox reproduction, folded and stapled just like the original. Includes single and double hose repair with trouble shooting and exploded view drawings. Price $15.00. #RM-DA56. Dacor Diving Lung Maintenance and Repair Manual, circa 1956. 12 page xerox reproduction, folded and stapled just like the original. Has step by step overhaul instructions, trouble shooting and exploded view drawing. Price $12.50. #RM-USD. 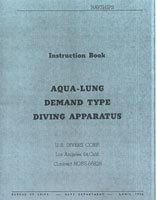 1971 US Divers Aqua-Lung Repair Manual. 23 page xerox reproduction, covers complete overhaul of Mistral, DA Aqua-Master, and Royal Aqua-Master. Price $15.00. #RM-DHN. Dacor/Healthways/Nemrod Two Hose Regulator Repair Manual. 25 page xerox reproduction, covers complete overhaul of Dacor, Healthways Scuba and Nemrod Snark III double hose regs , along with parts breakdowns for each. Taken from factory manuals. Price $15.00. #RM-EVD. 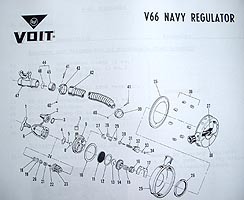 Exploded view drawings and overhaul procedures for any Voit, US Divers, Nemrod, Sportways or Dacor regulator from the 1950's, 1960's, or early 1970's. Dozens to choose from - email with your needs. Price $5.00 per set/regulator. #RM-JAB. 1966 Johnson Air-Buoy Owners Manual. 27 page xerox reproduction, folded and stapled just like the original. Includes setting up, operating, maintenance, and more. Price $20.00. #RC-JAB66. 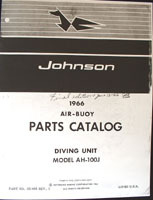 1966 Johnson Air-Buoy Complete Parts Catalog. 11 page xerox reproduction, folded and stapled just like the original. Includes flotation, air delivery group, and complete gas engine exploded view drawings. Could be used for Evinrude Aquanaut as well. Price $12.50. #RC-SM61. 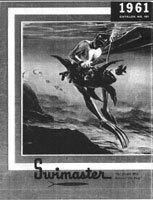 1961 Swimaster Skin Diving Equipment Catalog. 12 page xerox reproduction, folded and stapled just like the original. Includes the famous Duck Feet and Wide View Mask. Price $12.50. #RM-DECO. 1977 Scubapro Automatic Decompression Computor Manual. 11 page xerox reproduction, folded and stapled just like the original. Explains theory and operation. Price $10.00. #RM-AL56. 1956 Diving With The "Aqua-Lung", by Rene Bussoz. 32 page xerox reproduction, folded and stapled just like the original. The best reference available for learning to use a two hose regulator. Price $20.00. #RM-AL58. 1958 Diving With The "Aqua-Lung", a U.S. Divers publication. 32 page xerox reproduction, folded and stapled just like the original. The perfect reference for learning how to dive with a two hose regulator. Also covers maintenance and servicing of the Mistral and DA Aqua-Master. Price $20.00. #RM-UNI. Poseidon Unisuit Operating and Maintenance Instruction Manual. 15 page xerox reproduction, tells everything you need to know about the Unisuit, including donning, cuff and neck seal replacement, regular maintenance, etc. Price $13.00. #RM-MAKO. Instruction manual for MAKO high pressure compressor, Model K 14 and K 14-85. 20 page xerox reproduction, folded and stapled just like the original. Includes starting and operation, service and maintenance, troubleshooting, and technical information. #RC-MAKO. 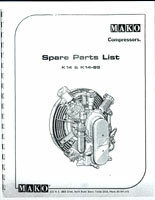 MAKO high pressure compressor illustrated parts catalog, for Model K 14 and K 14-85. 13 page xerox reproduction. Shows every single part on the compressor, with exploded view drawings, part numbers, and nomenclature. Price $10.00. #RM-COR. (Not pictured) Cornelius High Pressure Pump Conversion Plans. Complete instructions for converting Cornelius high pressure pump into SCUBA compressor. 5 pages, includes 8 illustrative photos. From Fawcett Publications, 1964. Price $10.00.